We continue our focus on the finalists projects at the 10th Architecture and Interior Design PORCELANOSA GRUPO Awards. This time, we put the emphasis on the Forward-Looking Projects – Professionals category, whose second finalist has been the Red Cube Office by Jesús Torné Valle. 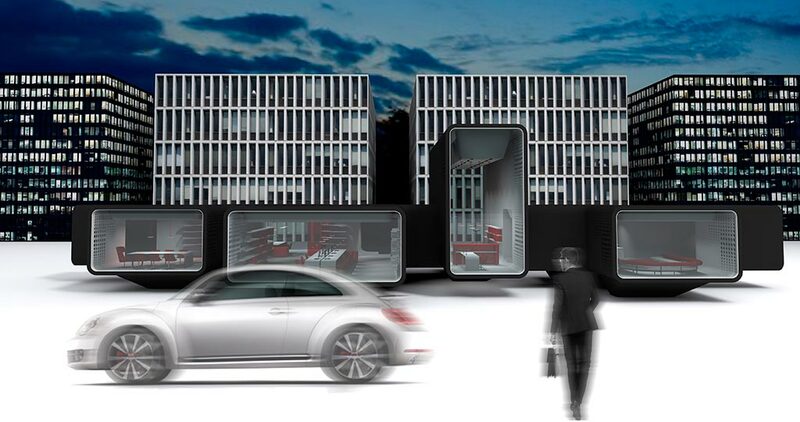 It is a highly-unique project, a prefabricated modular office consisting of an interior structure and a double covering through the KRION® Solid Surface mineral compact. It is made up of a lively sequence of containers, whose composition is based on branched cubes with a biomorphic appearance and adjustable configuration. The aim of this composition is to create a flowing interior space so that it allows for people transit and workflow between departments without getting strong partitions. 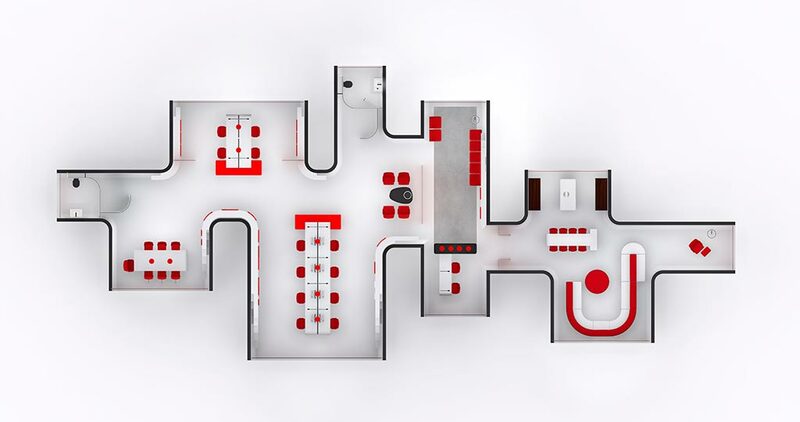 At the same time, each space is zoned by the project shape itself, therefore, it results in having a connection and independence simultaneously. 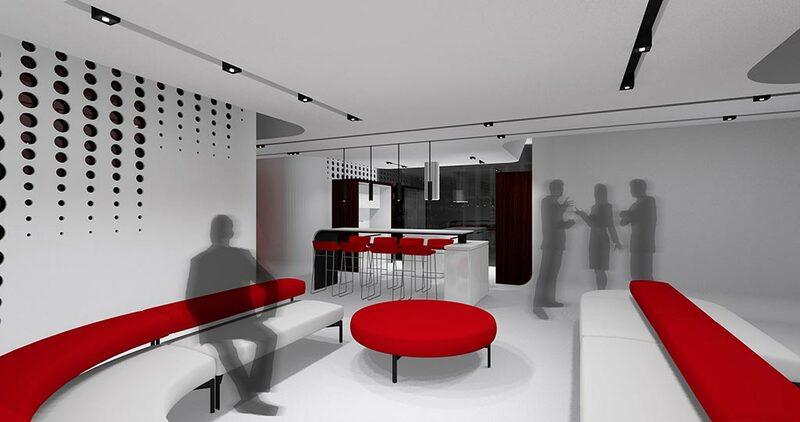 Regarding the interior arrangement of the Red Cube Office, it is worth highlighting the entrance lobby which brings the whole public work area and the private one together. The public area includes an informal attention area, a common workspace, a documentation room, a meeting room and two public toilets. 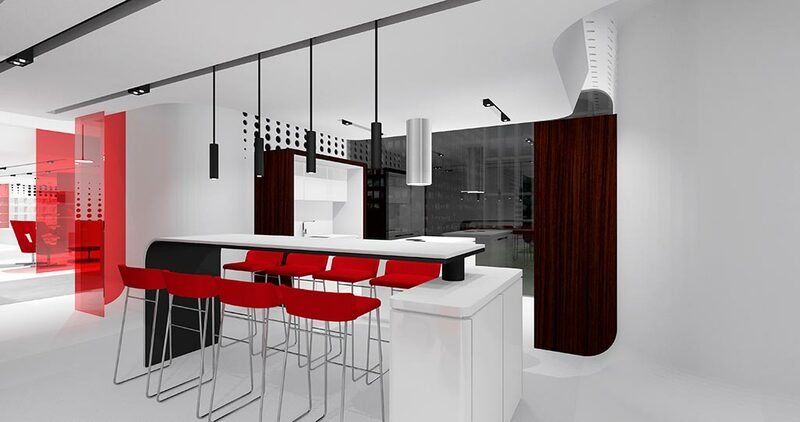 The private area accommodates a kitchen, a dining room, a leisure and rest area and a reading point. It is an interior space, which has an area of 350m2 approximately. 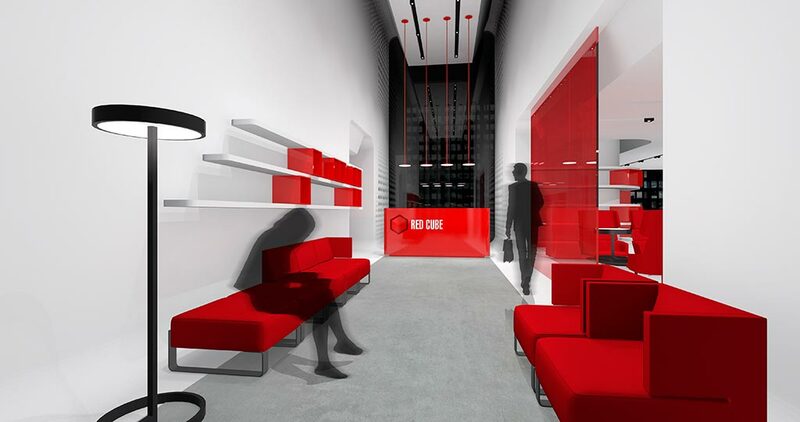 For the carrying out of the Red Cube Office project, the KRION® acrylic stone has been used to a great extent. It is the design which is present in the coverings, as well as in the partitions and the furniture. Its thermocurving, perforating properties and its continuous jointless surface have made the achievement of unique shapes possible. The KRION® model in the interior covering is the star colour, in other words, the 1100 KRION® Snow White, whereas in the exterior, one can find its version in black. 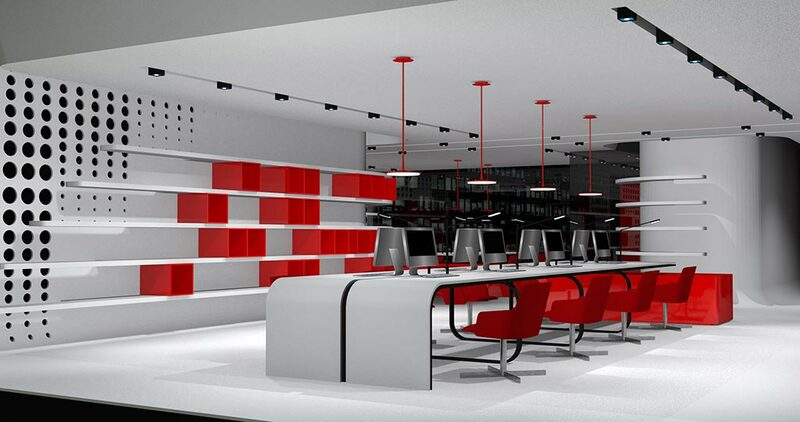 The furniture, on the contrary, combines three colours: black and white for the tables, white for the shelves, and red for the lobby counter and the container modules. 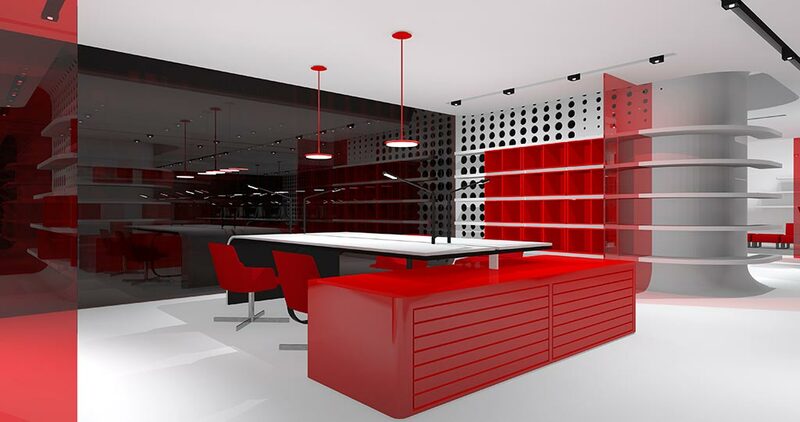 This very same colour, whose shades have given name to the project, is also done by Urbatek and the red extra-slim porcelain, installed in the cube bookcases. Additionally, the firm, Urbatek, is also present in the flooring. 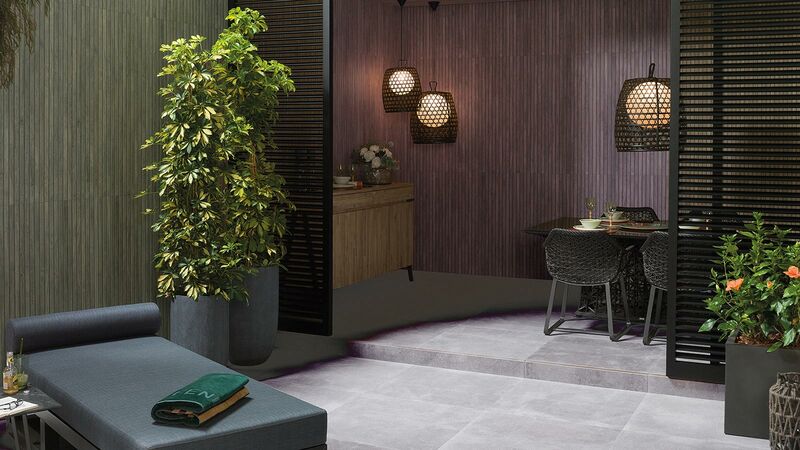 Having been created as a project with a high traffic and demand, the best suitable material for installing as the flooring was the full through-body porcelain tile. To be more specific, for the lobby tapestry the Town acero series was the choice, whereas the Town Extreme White series covers the rest of the flooring. 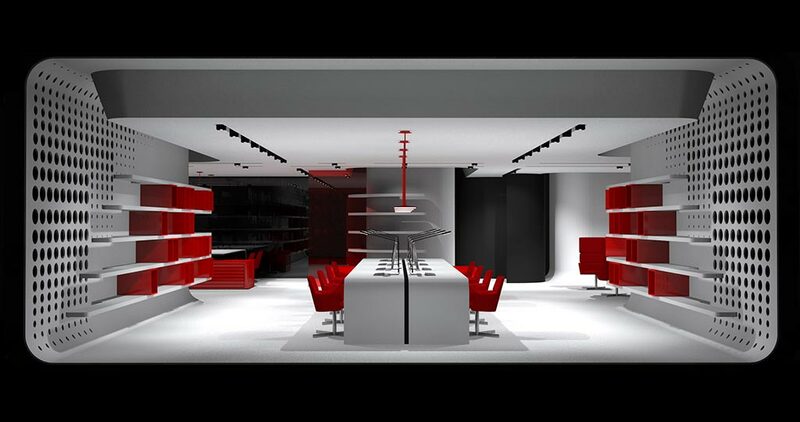 Getting back to KRION®, pure material with unique properties can also be found in the bathroom design. It is present in the vertical covering and partitions, in a double-layer KRION® in black and white. 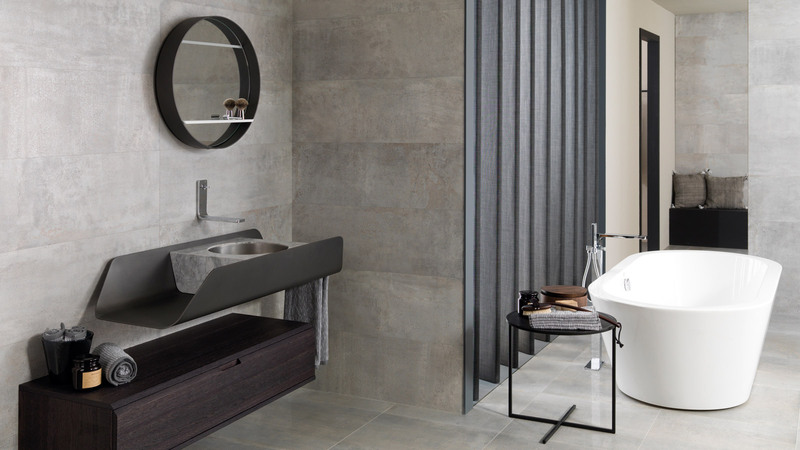 The bathroom equipment is done by Gamadecor and Noken, through the Ciclo bathroom furniture and basin and the Lounge taps, from both firms respectively. In the kitchen, it is worth highlighting the kitchen furniture designed by the chef, Quique Dacosta for Gamadecor: the E7 Roble Carbón and the E4 Blanco Snow. 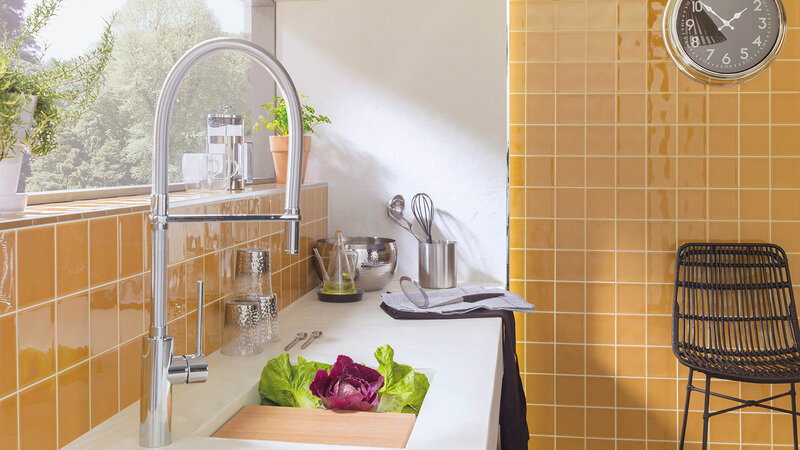 The kitchen taps are by Noken, the Soft model. 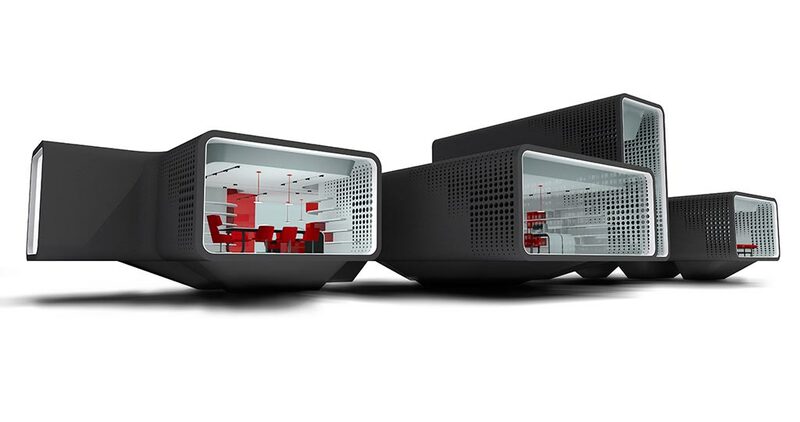 Red Cube Office is a Work Space aimed at being located in the lost spaces of the city such as small unused plots between buildings or islands of land, therefore, providing a low profile and a garden area environment. Its exterior lay out, and mostly its interior one, favours a design environment, a workspace which is essentially original and creative.